Knitted sideways garter stitch cuff worked by knitting from one end to the next, after which both ends are joined by doing a 3 needle bind off and stitches picked up around the circle. Doesn’t matter which end stitches are picked up as the cuff is reversible. Row 1: P2, *k1, p4 repeat from * to last 3 stitches k1, p2. Row 2: K2, *slip 1, k4, repeat from * to last 3 stitches slip 1 k2. Using crochet cotton and appropriate hook crochet 20 stitches loosely. End off. Hook up 16 stitches in the “V”’s on the back side of the waste yarn. With US size 2 /2.75mm needle slip one, knit across and decrease stitch 14 and 15 by knittng these 2 stitches together. Working without further decreases, slip first stitch and knit last stitch of every following row until you have 50 ridges, piece should snug nicely around your leg where you want your sock to begin. (Your ridges may vary depending on how loose or snug you would like your socks). Pick up the stitches from the waste yarn, Having beginning of piece and end of piece on two needles hold the yarn parallel and do a 3 needle bind off. Picking up in the inside of the chained selvedge pick up 50 stitches dividing them thus (12, 12, 14, 12). Knit one round (knit into the back of these sts.) even and begin pattern stitch above until piece measures 7 inches or desired length. 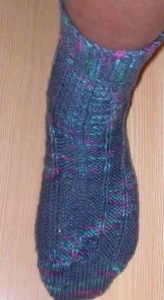 NOTE: Heel is worked in rows on 28 stitches. Move 2 instep stitches to heel needle to accommodate your desired wider heel, or if you don’t like a wider garter stitch heel work heel on 25 stitches. Row 1: Knit across the stitches until the last stitch, Turn. Row 2: Knit across row until the last stitch, Turn. Row 3: Knit across the row until next to last stitch, Turn. Row 4: Knit across row until next to last stitch, Turn. Row 5: Knit across the row until the next to last stitch turn, Contine knitting across leaving one more stitch unworked until the center 10 stitches remain unworked. NOTE: You will find your short rows will be more attractive if you pick up a stitch before gap (utilize the garter ridges) using your left hand needle then knit the next stitch and pass the picked up stitch over. Row 1: Knit across to the next stitch, pick up a stitch. Knit the next stitch and pass picked up stitch over turn. Slip first stitch without knitting to right hand needle. Row 2: Knit across to the next stitch. Pick up a stitch with right hand needle knit the next stitch pass the picked up stitch over. Turn slipping last stitch back to right hand needle. For the rest of the shaping you be picking up a stitch with right hand needle knitting the next stitch and pass the picked up stitch over. Repeat rows 1 and 2 until you have worked all the gapped stitches. Be sure to slip picked up stitch over the gapped stitches. Continue knitting in stockinette on needles 1 and 4 and in pattern on needle 2 and 3 until you are approximately 1 inch from the top of your longest toe. following Short Row Shaping instructions described earlier in this pattern. Your short row toe has now been turned. Graft toe closed.